I have 2 of the 9L Really Useful Boxes and I was wondering if there are any US options for storage for these boxes? Sally 4th sells some really nice MDF kits but S&H is pretty crazy. I have some of the 11L size and use a magnetic sheet to hold figures based with paper steel. You can can cheap mag sheets that are about 15" x 10" at HD or Lowe's – magnetic vent covers. Yea, I'm using the Litko magnetic bases for my 15mm stuff so maybe that's the best route. How do you "stack" stuff using this method though? Really Useful Boxes ships in the US. I think they have a plant in the Midwest. I routinely order from their web page and receive them within a week. Shipping is reasonable. 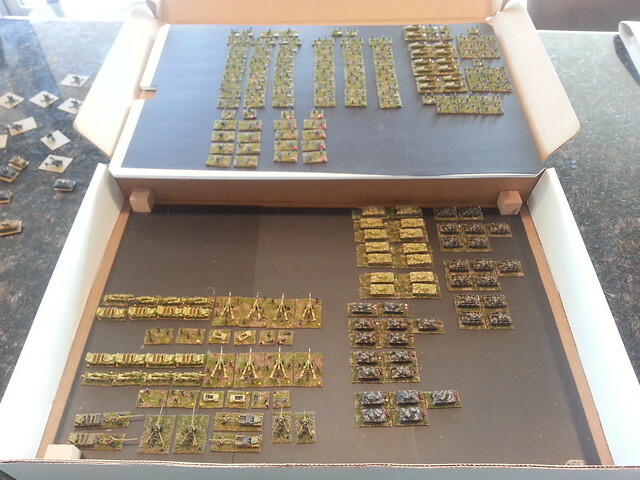 I have the boxes…I'm looking for mdf kits for those boxes for my mini's. Sally 4th, a UK company, sells them but the S&H is like 20 pounds. I'm looking for a US company that makes mdf kits. They ship out of Illinois—I have ordered direct several times, shipping to St. Louis. They have a US website. I have orders a lot of stuff from Sally 4th and don't remember the shipping being bad. I usually order several things at once though to amortize the cost. The Sally 4th photorealistic MDF building kits are really, really nice. They helped me win an award at Fall In in November. I do something similar Extra Crispy – but have a wooden block to support the middle – I put it in at the time – it is not fixed – though it could be. I like the 3D printer idea, but I don't know anyone who owns one. Extra Crispy….your idea would work if I can't find a less spendy deal on some mdf inserts. Check your local public library or google Makerspaces in your area. Looks like Noble Knights doesn't carry very many of each kind of insert, but at least they carry them. I used to buy Really Useful Boxes at Staples, (or was it Office Depot?). Multiple sizes. Here's a link to the US Staples with the boxes….although I bought mine a their local store. Do you have the file for that insert? Could I not just send the file to a local place that can do 3D printing for me? I guess I could use the dimensions of the Sally 4th product to some 3D printing service and see what they can cook up. Email me at joxash at grandecom dot net and we can discuss it. I can easily send you the stl files. Thanks everyone for the suggestions. I'm going Extra Crispy's route. Found some cheap ($1) sheet metal at Lowes and my Litko magnetic bases adhere perfectly. Got some cheap foam board and cheap wooden squares from Micheals. $15 USD and I've got enough for 2 boxes. Beats the hell out of spending $60 USD+.